The Twelfth National Jazz ,Blues and Rock Festival. 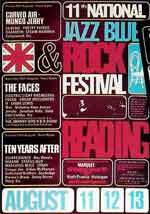 Yes we know it states the festival is the eleventh festival on the adverts, but they cocked up in 1971 and the mistake in numbering was not rectified on the posters until the 1974 festival. 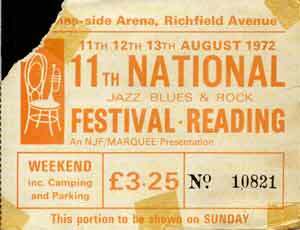 The second year at the Reading site and the 1972 festival was once again marred by police arrests of festival goers. 130 people were arrested over the weekend, mostly for drug offences but some for offensive behaviour (many instances of which were debatable ) , or petty vandalism . Once again a very large sum of money was spent on policing what was a largely inoffensive crowd. The police presence was way over what was needed for an event of this nature, with police choppers circling the site and special courts busy processing those rounded up by the police as they once again continually stopped festival goers and randomly searched both them and their baggage. For some strange reason ( pressure from the police , or politicking between relief organizations ? ) Release were not invited to attend but BIT and ADE were there ministering to those who had OD 'd , been incarcerated or simply fallen ill through eating out of date burgers. 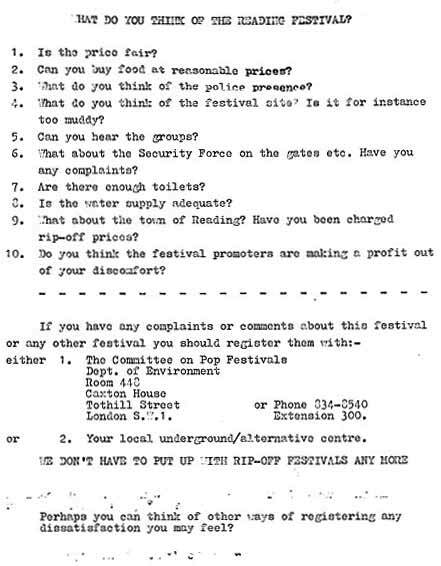 There is little doubt that the threatening level of paranoia shown by the Thames Valley police towards festival goers during the early 1970s is almost unprecedented in the history of the British police forces. 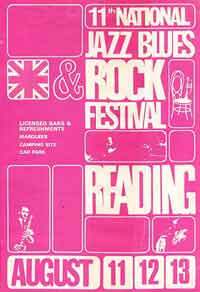 This was to culminate in the nasty scenes at the Windsor Free Festival in 1974.It is perhaps fortunate that the more of middle of the road crowds who attended the Reading festivals were so passive. If they had shown any sort of resistance towards the oppressive tactics that were utilised by the police during this period they would no doubt have been met with considerable force . But drug related rock festival paranoia always seems to take priority over beer fuelled sport related violence doesn't it ? I wonder if the revenue the government derives from booze has anything to do with it ? 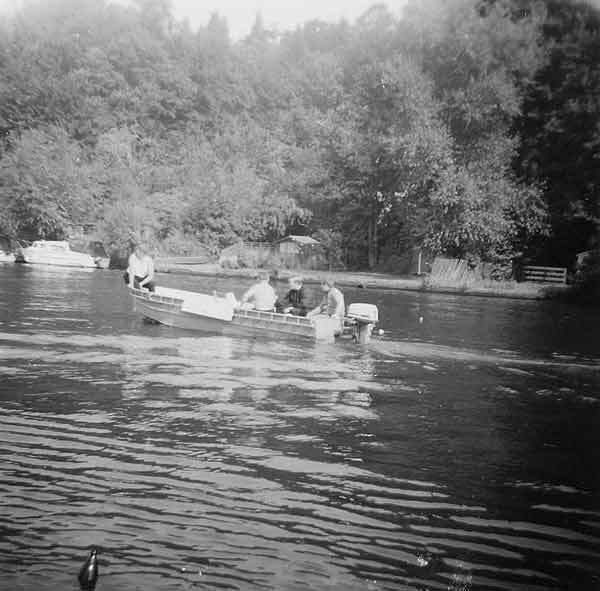 Intrepid TV police take to the water to help stamp out the scourge of water bourne drugs ! 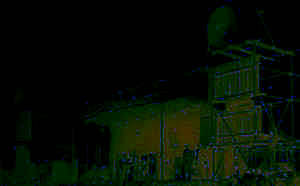 Panoramic view of the 72 site. Oh yeah, the MUSIC , right, in between busts, we had music . Not the most memorable Reading, but some reasonable acts took to the boards. Genesis were the stars of an otherwise fairly lacklustre bill on Friday . 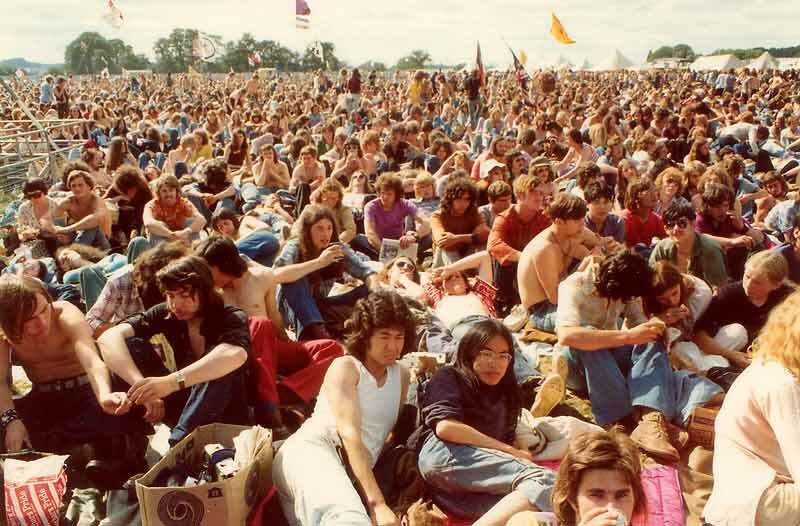 The weather was fine , but most bands failed to move the crowd to their feet. By contrast Genesis had the crowd screaming for a full five minutes after they had left the stage . 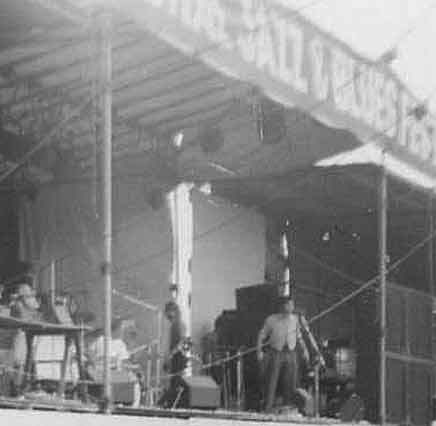 Even former crowd pleasers Mungo Jerry ( a brit rock festival hit of 1970 ) could not make much of an impact , perhaps the novelty of their act had by now worn off. Nazareth did not play despite being present. Their late arrival meant they were not allowed to play and the other acts sets were extended to cover the gap. Curved Air came on around midnight and eventually built up a good head of steam, despite the cold conditions at that hour , but despite their headliner status it was Genesis who made the most impact with the crowd. 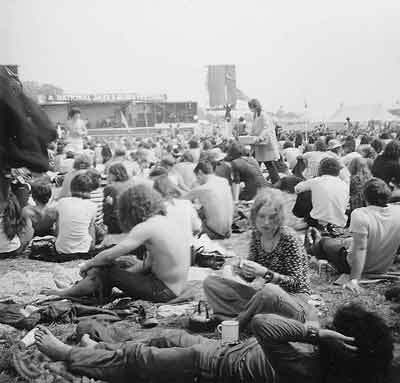 By 1972 the festival featured two stages enabling a quick turn around between acts. Saturday was mostly dull, both weather wise and in the response of the audience to the majority of the acts. The PA acted up during some sets and Solid Gold Cadillac did not play due to their transport packing in and a consequent late arrival , it appears that late arrivals were not slotted in whenever possible, they just were factored out of the lineup. 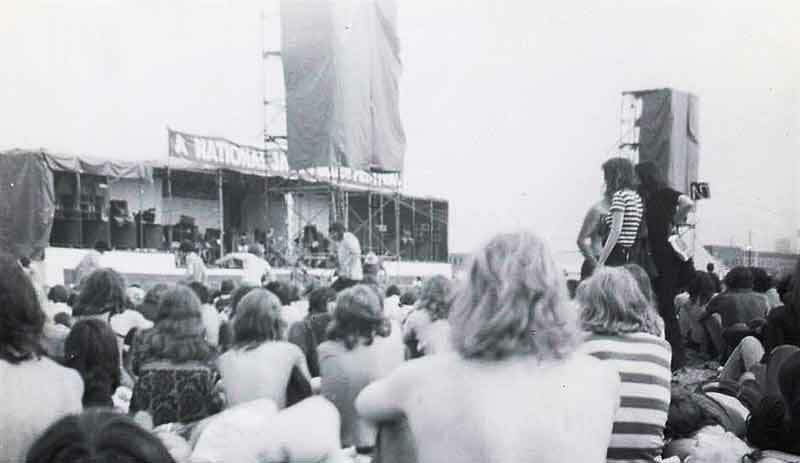 The Johnny Otis R & B show , featuring the Three Tons of Joy , Mighty Flea and Big Daddy Rucker were notable for stirring up the crowd , along with the Edgar Broughton Band who actually got the crowd to their feet for the first time during the day. 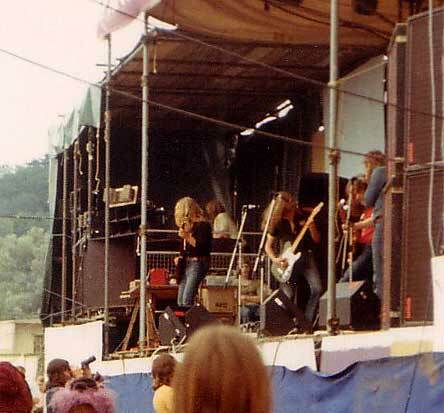 Focus were the hit of the afternoon , by 1974 they were back as one of the headliners. 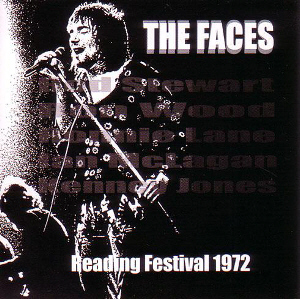 The Faces were often noted for their slackness in those days, but this time they delivered . They performed a fairly tight set, with a minimum of stuffing up and no overt drunkenness on their part . The weather brightened up considerably on Sunday , which helped to produce a better vibe than the day before although once again it did not make up for the lack of musical highs . Wizzard kicked off proceedings to a lacklustre reception, and it was left to Stackridge to get the first good response from the audience , although their set was spoilt to some extent by sound problems . Ten Years After put on a good show to finish off the festival to warm applause from the appreciative crowd . Overall it was a "nice " festival, nothing to really complain about apart from the police presence outside the arena and the overall lack of really talented acts who could raise the collective audience consciousness into the heights that the really top notch festival acts are capable of achieving. 1972 acts and fees paid to the artists. 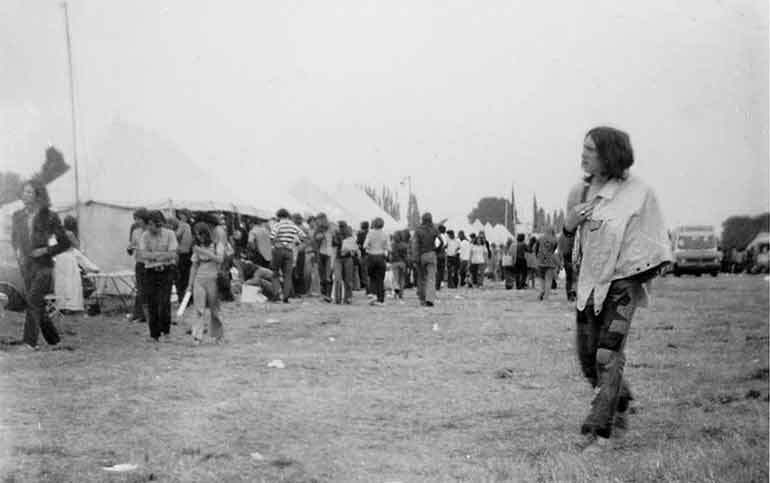 Known recordings of the 1972 festival. The Knife -Twilight Alehouse -Watcher Of The Skies - The Musical box - The Return Of The Giant Hogweed . Unofficial boot has been released , audience recording recorded from the press compound. You can find out the complete line ups of the first festivals if you follow the links below . Most of these have fairly complete documentation .But new contributions of any sort are always welcome regarding any of the festivals. This site is non profit making , its a site for die-hard fans- and run as a source of information for those interested in Rock music of the past .We are completely against the sale of bootlegged artefacts , especially musical ones .We attempt to obtain permission to use articles and photos wherever possible, but on occasions , due to the age and obscure origin of some items , we have not been able to ascertain the owner of the copyright .It is also possible that occasionally we are sent material from sources that assert that they own the copyright of material, but their claims are spurious - If you see any material on the site that you believe you own the copyright of - please send us an e-mail with proof that you have ownership of the image and we will remove the offending item from the site immediately.